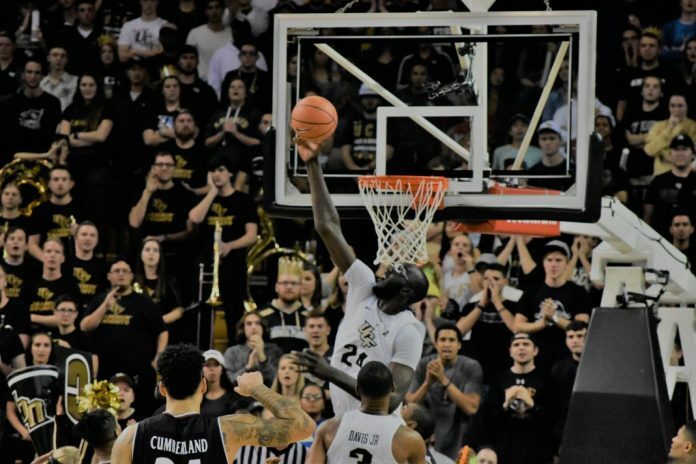 The men’s basketball team at the University of Central Florida will be at full strength at the start of the 2018 season with seniors B.J. Taylor and Tacko Fall, and Aubrey Dawkins, head coach Johnny Dawkins’ son. The Knights have been picked to win the American Athletic Conference ahead of the season for the first time in its Division I history with 114 points (6 first place votes), ahead of defending champion Cincinnati. UCF struggled in the previous season to reach its potential with injuries to blame – Aubrey and B.J., namely – and an uneven depth chart to cap their success at 19-13. Only one starter will be absent from the previous roster, translating to an experienced squad under the guidance of Dawkins. In the 2016-17 season, UCF had its best season ever in Dawkins’ first year as it trailblazed through to the NIT Tournament in Madison Square Garden, NYC with victories against ranked Cincinnati, Iowa, and Iowa State. Taylor was picked as the preseason American Athletic Conference Player of the Year with Fall also receiving preseason all-conference honors. The opening game will take place at CFE Arena on November 6 at 6:30 p.m. against Rider.